Screening for Listeria in foods and environmental samples requires confirmation of any presumptive positive samples. The FDA and ISO methods involve isolation from presumptive positive samples using two agars with selectivity for Listeria. However, Solus Listeria and Solus One Listeria assays require only a single selective agar for confirmation. Here we look at some of the available agar options. Figure 1. Solus Agar-OA plate (a) and non-selective TSA plate (b). Each plate was spread with 100µl of a mixture of Listeria monocytogenes, Listeria innocua and background microflora (streptococcus, bacillus, enterococcus and staphylococcus) and incubated for 48 hours at 37°C. Solus Agar-OA (Agar Listeria according to the formulation of Ottaviani & Agosti) suppresses the growth of non-Listeria organisms and distinguishes between Listeria and non-Listeria growth by using colour-forming substrates. This makes it an excellent agar plate to use with samples that have a high bioburden. Incubate Solus Agar-OA plates at 37°C for optimum results. The selective agents in the agar include lithium chloride (LiCl), taking advantage of listeria’s high salt level tolerance, as well as anti-microbial compounds (ceftazidime, polymyxin, nalidixic acid & amphotericin). Enterococci and some Gram-negative bacteria cannot tolerate high salt levels. The LiCl content in Solus Agar-OA therefore inhibits the growth of these organisms. However, Staphylococcus and Bacillus spp. are tolerant to LiCl, hence the need for other selective agents. The chromogenic element of the agar relies on the β-glucosidase enzyme activity common to all known Listeria species. 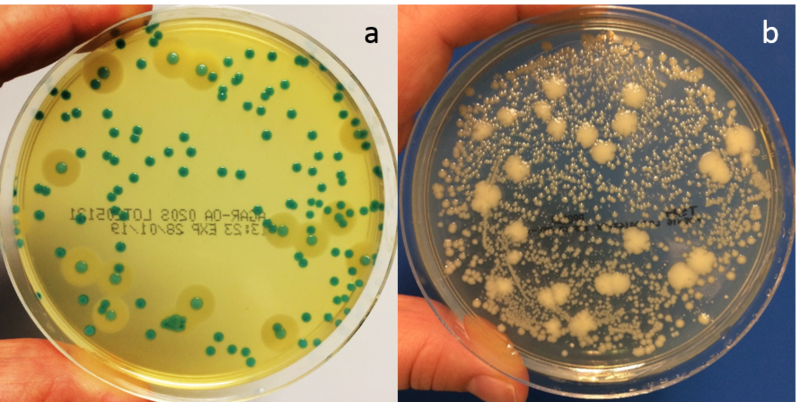 As Listeria colonies grow, they will appear blue-green in colour due to the β-glucosidase enzyme metabolizing the chromogenic substrate, X-glucoside, present in Solus Agar-OA. A few strains of enterococci and bacilli also show this activity. However the selective agents in the agar generally inhibit these. 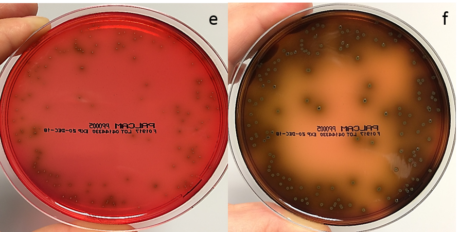 Solus Agar-OA plates also offer a clear differentiation between Listeria monocytogenes and other Listeria species due to phosphatidylinositol-specific phospholipase C activity. The hydrolysis of a specific proprietary lecithin in the agar forms an opaque halo around L. monocytogenes colonies. Other Listeria spp. generally do not show this activity although a halo may be seen around some strains of L. ivanovii. Therefore, a blue-green colony with an opaque halo is L. monocytogenes (or possibly L.ivanovii), a blue-green colony with no halo is Listeria spp., and sparse colourless colonies are not Listeria. Figure 2. An Oxford plate was spread with 100µl of a mixture of Listeria monocytogenes, Listeria innocua and background microflora (streptococcus, bacillus, enterococcus and staphylococcus) and incubated for 24 (c) and 48 (d) hours at 37°C. Oxford agar plates use LiCl, acriflavine, colistin, fosmycin, cefotetan and cycloheximide as selective agents. These elements completely inhibit Gram-negative bacteria and most non-target Gram-positive species. However, growth could include some enterococci or staphylococci as well as Listeria spp. The typical recommended incubation temperature for Oxford plates is 35-37°C depending on manufacturer. 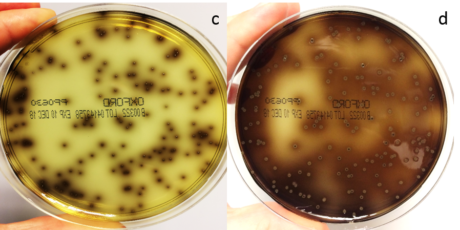 Aesculin in the media distinguishes Listeria from other organisms but Oxford agar does not offer any differentiation between L. monocytogenes and Listeria spp. All Listeria spp. can hydrolyse aesculin, producing aesculetin (6,7-dihydroxycoumarin) which reacts with ferric ions in the media, turning it black as the colony grows. Enterococci may also cause blackening of the media if they are present so care needs to be taken when selecting colonies for biochemical identification. If coagulase negative staphylococci are present in the sample, they may grow as aesculin negative colonies. Although these are generally easy to identify as not being Listeria, the presence of such colonies may interfere with the growth of the target, making it more difficult to get a clean, well-isolated colony for further biochemical identity testing. They may also be misjudged as being aesculin positive if there is an aesculin positive colony in close proximity. Although Modified Oxford agar (MOX) plates are similar to Oxford plates there are some differences in the selectivity agents to improve the recovery of more sensitive strains of Listeria monocytogenes. The level of LiCl is 12g/l in MOX as opposed to 15g/l in Oxford. There is also half the colistin (10mg/l vs 20mg/l) and 20mg/l ceftzidime replaces the acriflavine, fosmycin, cefotetan and cycloheximide. For optimum recovery, these plates should be incubated at 30°C. MOX does not show differentiation of L. monocytogenes and Listeria spp. Figure 3. A PALCAM plate was spread with 100µl of a mixture of Listeria monocytogenes, Listeria innocua and background microflora (streptococcus, bacillus, enterococcus and staphylococcus) and incubated for 24 (e) and 48 (f) hours at 37°C. PALCAM plates have a Columbia blood agar base and are red in colour due to the presence of the pH indicator dye, phenol red. The selective agents polymyxin, acriflavine, lithium chloride and ceftazidime are included along with aesculin and mannitol as indicators for Listeria spp. Mannitol fermentation leads to the production of acids, lowering the pH in the agar and turning the phenol red to yellow. If this colour change is observed around a colony then it is not Listeria as Listeria do not ferment mannitol. As previously mentioned, all Listeria hydrolyse aesculin resulting in a black zone of media surrounding the colony. All Listeria, including L. monocytogenes, will therefore appear as a gray-green colony surrounded by black media. Staphylococci or enterococci may grow on PALCAM as yellowish colonies surrounded by a yellow zone of media. These should obviously be avoided during colony selection for biochemical ID of putative Listeria colonies. There is no differentiation between L. monocytogenes and other Listeria spp. on this agar. Solus supplies Agar-OA for confirmation of a presumptive result following Solus Listeria or Solus One Listeria assays. These OA plates offer an easy and reliable way to select for Listeria species, even when samples are heavily contaminated. Solus OA also differentiates between pathogenic L. monocytogenes and other Listeria species. This can be a great advantage for picking colonies for further biochemical identification when required. For further information about Solus Agar-OA and the other dedicated media we have to offer click here.